How often do we have to make decisions in our life? Literally every minute. Small decisions make small impacts, but big ones can change our lives. And if you are an online store owner the choice of a proper shopping cart is a vital issue for you and your business. But here’s a tough one: how to make the right decision between two such similar platforms as BigCommerce and Shopify? Many people consider that BigCommerce and Shopify platforms are almost identical. Of course, there are some common peculiarities. For instance, both platforms are hosted e-Commerce solutions with user-friendly design and store management features. However, as they say: “the Devil is in the details”. So let’s try to look deeper and help you figure out which platform suits your needs better. Both are considered to be simple in terms of establishing and running an Internet shop. Moreover, all the Shopify reviews and expert opinions state that it is currently the most user-friendly platform. It is also said that if there is any shopping cart which can compete with Shopify in usability, it is definitely Bigcommerce. Both platforms can boast about their intuitive administrative panels and very simple systems of product and inventory management. No specialized knowledge in HTML or advanced design skills will be required to create and run a profitable, beautiful and unique looking online retailer. Undoubtedly, professionally designed Shopify themes (over 100 of them) and all the interface tools can help you create a unique, alluring website, even if you are not very good at it. Bigcommerce templates (a bit more modest though) are also quite good in this context, but you will have to apply little bit more efforts to handle design customization of your web store. Bigсommerce has full range of promotional functions, including SEO friendly URLs, coupons and gift certificates, promotional banners and wish lists, etc. Unfortunately, Shopify’s out-of-the-box set of SEO and marketing features is quite small. However, most of them are available in online apps store for quite reasonable prices. And when you get your store packed with plugins, Shopify will definitely impress you, especially in terms of SEO-friendliness. Bigcommerce leaves no chances to its opponents in this case. Products can be successfully delivered all over the world by means of such well known companies as FedEx, UPS and eWay. Shopify’s shipping support is quite limited outside the North America, even though the company is actively working on improving this bitter drawback for users elsewhere. 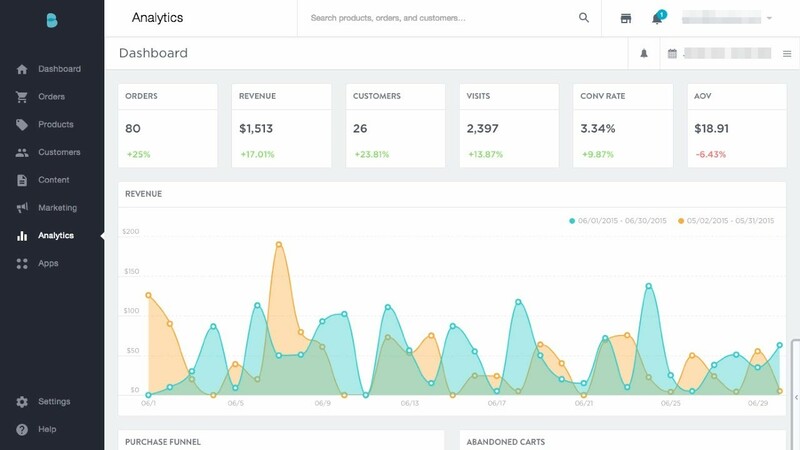 One of the most important pros of BigCommerce is the back end reporting. Shopify provides store owners with some basic reports and they will probably suit most of the customers. However, it is not comparable with 25 built-in business reports that BigCommerce can offer you. Both shopping carts are not free of charge. But you will get an opportunity to use free trials and decide on your own if you are ready to pay for it. Though Bigcommerce offers you more e-commerce tools out of the box than Shopify does, the latter one has much more developer ecosystem. At the moment, Bigcommerce has about 250 apps available (paid and free), whereas Shopify offers you over 1,100 apps in total. Irrespectively of the size of your store, you’ll definitely want to take use of several of them. In addition to providing you with more marketing / promotion tools (which would be useful for Shopify), the extensions can also help you manage and automate lost of routine day-to-day administrative tasks. Note, however, that some of the add-ons will add to your monthly bill, since quite several of them are paid. When it comes to transaction fees, there’s nowhere you can hide if using Shopify. Depending what plan you are, you’ll have to pay from 2% for “lite” to 0.5% for “unlimited” from every transaction performed in your store. You may, however, avoid that if you use their Stripe powered 'Shopify Payments' option, but it’s currently available in the US, UK and Canada only. On the other hand, Bigcommerce doesn’t impose any additional fees at all expect of credit card processing fees (typical for EVERY shopping cart). So, now you face one more decision. Should you chose Bigcommerce or Shopify? Consider all the advantages and disadvantages and make your own choice. If you are already running an Internet store and have decided to migrate Bigсommerce to Shopify or visa verse Shopify to Bigсommerce remember that this process can be really easy with Cart2Cart.